Five militants, including a suicide bomber, stormed the luxury Dusit complex in the Westland's district of the capital last Tuesday, killing at least 21 people and injuring dozens. What is it like to report a terror attack? 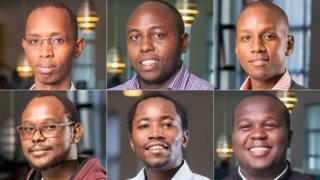 Cellulant, described as one of Africa's most innovative start-ups in the world of financial technology, hailed its six employees killed in the attack as brave and selfless. Sensing trouble Mr Mbaria and Mr Kuria - who were leading a team meeting - started helping their colleagues to evacuate the office. Mr Mwaniki joined them as they guided staff out of Cellulant's office on the fifth and sixth floor of the building. "One of our colleagues was miraculously unharmed. Jeremiah, Mike, John , Kelvin and Denis had shielded her into the back corner behind them, effectively removing her from sight," the firm said. "He guided his team with humility and corrected with humour. He loved God and everyone he came across, and always challenged his team to grow." "He took on the responsibilities of leadership very gracefully and lead by example, working late to help his team meet their deadlines," Cellulant said. Passionate about his job, Mr Gitonga believed "technology would change the world", the firm said. It described him as "an intelligent and versatile engineer" with a thirst for knowledge and learning. He single-handedly overhauled the product's user interface making it easier and more friendly to use, the company said. Fondly remembered by those at Cellutant as "the ultimate geek", Mr Kuria had worked on all the company's major products, and was part of the team that built the technology that supports Cellutant services. He was also described as the company's "unofficial documentarian". "If you wanted a photo from any event in the past 10 years - Ash would have had it," Cellutant's tribute said. "His knowledge of everything about everything was hilarious," it added. "[Ashford] will be remembered best for his big smile, warm personality, his kindness [and] love to everyone - and most importantly his tenacity." "Energetic" and "happy" was how Cellulant described Mr Kareithi, who started as an intern at the company but proved himself to be one of the best engineers. He "never shied away" from taking on the most challenging of tasks, the firm said. "He helped unconditionally, and always sought to mentor new staff members and share knowledge." "Just because it is not my job, doesn't mean I can't do it," Mr Ndiritu was known to tell colleagues at Cellulant in need of help. As a quality assurance tester "he was always willing to go the extra mile to help when called upon", the company said in a statement on Twitter. "Jovial, calm and best-known for his humour", is how they summed up his personality. The team "delivered the app in 86 days, four platforms, four languages in 33 countries in Africa", Cellulant said. The information security expert was described by his employer as a "curious explorer, strategic thinker, a gentleman and exemplary leader". Cellulant secured coveted information security certification thanks to Mr Mwankiki's "intellect", the firm said, adding that he would be remembered as "a calm and humble spirit".